One of the things that I think causes a barrier with regards to equal treatment of LGBT people is an overly simplistic model of sexual orientation. This is especially true for people who experience attraction to multiple genders–sexualities like bisexual and pansexual, for example. Even among the gay community, people who experience attraction to more than one gender are often assumed to be lying about their sexuality. A close friend of mine who I’ve mentioned on this blog previously, identifies as pansexual. In high school, he used the label “bi,” and people frequently told him, “No. You’re either gay or straight. You can’t be both.” When he tried to explain to them that he was, in fact, attracted to both genders, people assumed he was just using the label “bi” as a stepping stone to coming out gay. This could not have been farther from the truth. While he had not had any relationships with men at the time, he had actively pursued relationships with both genders, and genuinely had no preference for one over the other. I recently stumbled upon this video, in which lesbians describe what they think about bisexual women, and even among these members of the LGBT community, I saw the same bias my friend had encountered. As I said earlier, I think this boils down to an overly simplified model of human sexuality. We’ve finally accepted that people can be either straight or gay, but sexuality includes even more variation than that, and that variation hasn’t been accepted yet by everyone. On the left side of the chart is the label “straight.” A person with a score of 0 experiences attraction to the opposite gender only. On the right side of the chart is the label “homosexual.” A person with a score of 6 experiences attraction to the same gender only. In between the two are varying degrees of attraction to both genders. People with a score of 3 are exactly bisexual. They do not favor either gender, and are attracted to both about equally. Yet there are those who are mostly straight but have some attraction to people of the same gender; simultaneously, there are people who are mostly gay, but have some attraction to people of the opposite gender. It isn’t perfect, but it opens up the idea that a person who is mostly one way or the other can have some attraction that does not match their primary label. It also lends itself to the idea of bisexuality, allowing a way for people to visualize how this attraction fits in with other ones. Here’s where the title of this post comes into play. I’d like to see more people utilizing this idea of continuous sexuality in some way. I’d like to see people, especially people who fall anywhere from a 1 to a 5–those in-between places of sexuality–come out as not completely matching the labels society accepts. I suspect that if more people were to openly admit that sexuality does not necessarily fall into a perfect dichotomy, people who identify as bisexual, pansexual, and so forth, will be understood and accepted. Maybe I’m crazy, but here goes. I’m definitely not a 0 on the Kinsey scale, but I’m not a 3 either. I use the label straight because it most accurately describes my sexual orientation, but I’m at least a 1, maybe a 1.5 if half points are allowed, though I don’t think I’m quite a 2. I definitely experience some attraction to women, though not as frequently as I do to men, and not enough that I’ve ever been actively interested in pursuing a relationship with a woman, though there have been times when I haven’t been completely opposed to it. There’s a stereotype that all women are at least a bit bisexual, but I don’t think this is true. I also don’t think that all men are either gay or straight, but I suspect that due to the way society views male homosexuality more negatively than female homosexuality, we are less likely to hear about it. What about you? 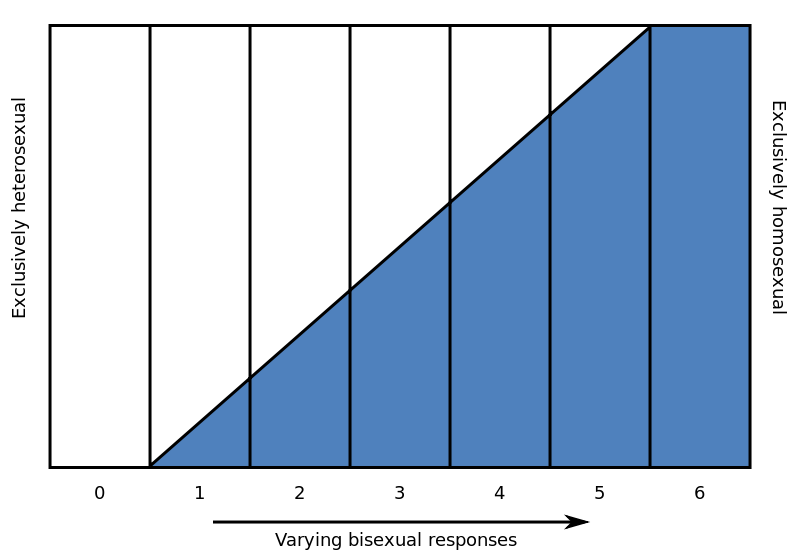 Where do you place yourself on the Kinsey scale? Do you match the exact labels, or are you somewhere in-between? Why do you think there’s so much misunderstanding concerning bisexuality and other such sexual orientations? Feel free to leave a comment. As always, all opinions are welcome; just be respectful and think things through before posting.